Before last weekend, I had never tasted plum eau de vie, yet I have had a bottle of it in my auxiliary liquor cabinet for nearly two months. Eau de vie, of course, is made by fermenting fruit and then distilling it twice. It is typically unaged. Most plum eau de vie, from what I can gather, is made from Mirabelle plums, and certainly, my bottle proudly proclaims that this is the case. Eau de vie is expensive, which is why you don’t see too many drinks that use it as the base, but I think it’s lovely, and you can expect to see several more plum eau de vie drinks in the near future. My initial impression of this spirit was that the flavor was light, and I feared that too many strongly-flavored ingredients would crush it. I still had some Stone’s Ginger lying around, and for a home mixologist, it is doubly important to use up a fortified wine before it goes off. I am hooked on Stone’s Ginger right now, so I had it in my head to use the eau de vie for a classic 6:3:1 sort of a drink. The 6:3:1 template is a starting point, not an ironclad rule; in fact, it is thus with any drink template. It establishes a baseline, which you then taste and modify as appropriate. In this case, I added only half an ounce of Stone’s Ginger to one and a half oz of eau de vie, and I found that I could not taste the ginger at all. Indeed, the nature of eau de vie seems to be that although the flavor is light, it is resilient. I added another half ounce of ginger wine, and still the plum was overpowering. I added yet a third half ounce, and finally, the flavors came into balance. For a modifier, I still had some Thai tea syrup lying around, and it went into the mix, more out of a desire to use the syrup than in pursuit of some grand flavor concept. The best mixed drinks tend to result from careful planning, but sometimes you can get lucky with a shot in the dark. 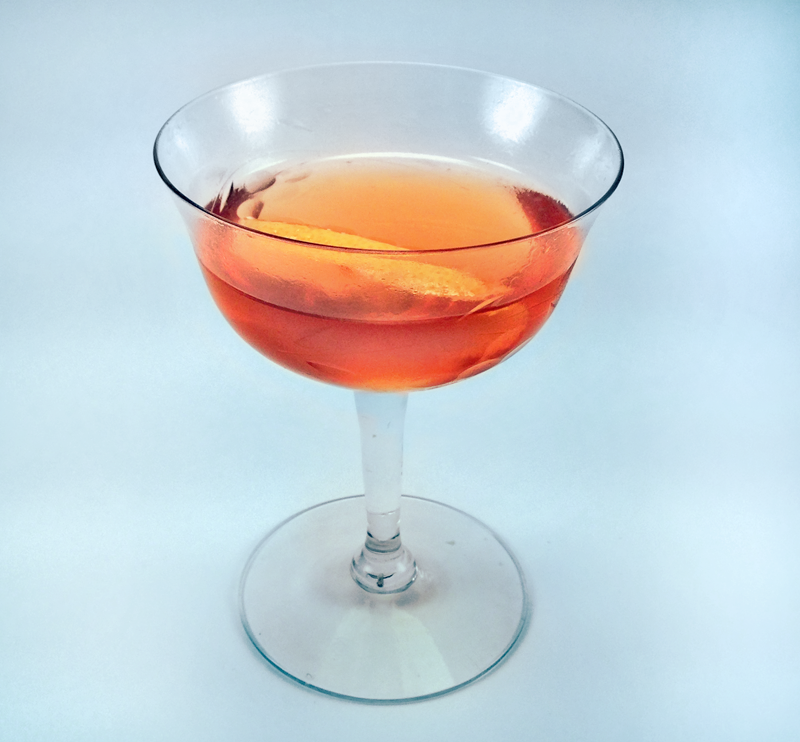 Moreover, good technique and taste-driven iteration can smooth out a lot of the wrinkles in the drink-creation process. Check out those lemon oils, floating on the surface of the drink. 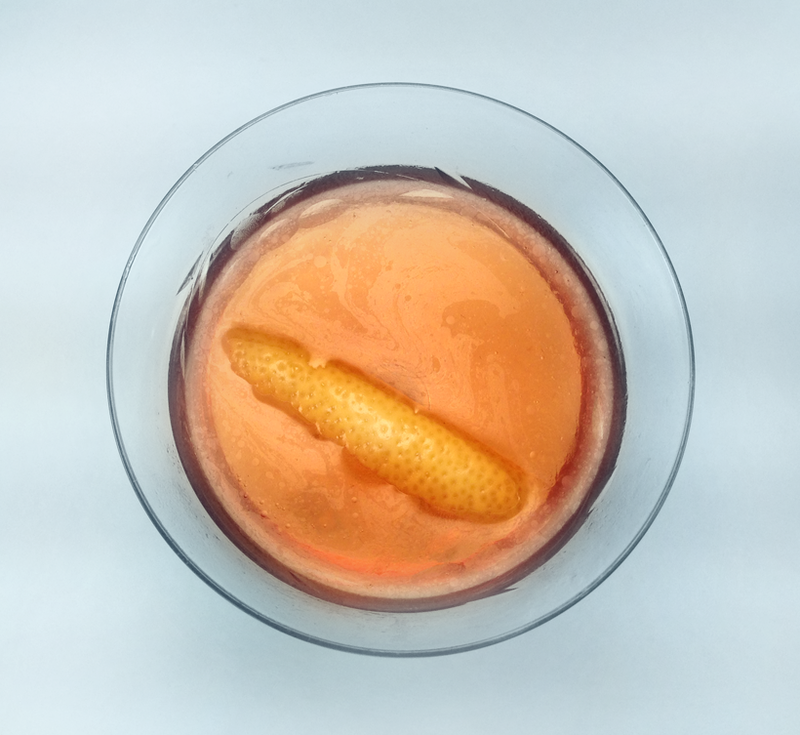 Stir over ice and strain into a cocktail glass. Garnish with a lemon peel, and express the oils. As we were developing this drink, neither James nor I were enthusiastic about the direction it was going, but the orange bitters and the lemon peel really tied it together. The first sip did not arrest my thirst, but in subsequent sips, the flavor started to grow on me, and by the end I was sad it was over. The plum was subtle, yet crisp, and the lemon peel complemented it spectacularly. The ginger wine could probably have been dry vermouth without a real loss to the drink’s integrity, though the thai tea syrup’s tannin brought a nice body and roundness of flavor that you could not get from a simple or fruit syrup, though perhaps with a spice. Categories: original creations | Tags: alcohol, bartending, bitters, booze, cocktail, cocktails, craft cocktails, drinking, drinks, eau de vie, ginger wine, lemon, lemon oil, lemon peel, liquor, mirabelle, mixed drinks, mixology, orange bitters, plum, plum eau de vie, stir, stone's, stone's ginger, tea, tea syrup, thai tea, thai tea syrup | Permalink.